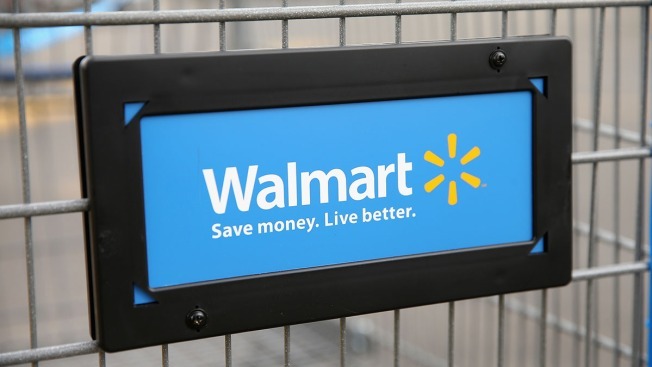 In this file photo, Walmart logo is displayed on a shopping cart at a Walmart store on August 15, 2013 in Chicago, Illinois. Walmart, the world's largest retailer inked a $3.3 billion deal to buy web retailer Jet.com. Wal-Mart has agreed to buy fast-growing online retail newcomer Jet.com, which had launched with a splash a year ago when it announced its intention to challenge online leader Amazon. Wal-Mart is paying $3 billion in cash and another $300 million in stock. The deal announced Monday underscores how serious Wal-Mart is about igniting its online business, which has been slowing even as it has been making big investments in new distribution centers and expanding services. Buying Jet.com would let Wal-Mart compete more effectively with Amazon.com and other online retailers. The deal also reflects the difficulties for startups like Jet.com to make it on their own in a sphere dominated by Amazon.com with its network of distribution hubs and the powerful asset of its Prime membership program. The acquisition is expected to close this year upon regulatory approval, Wal-Mart said. Buying Jet.com will help Wal-Mart grab a higher-income customer who typically is younger. Jet.com has more than 400,000 new shoppers added monthly and an average of 25,000 daily processed orders. Wal-Mart says that it will also be incorporating some of Jet.com's "smart" technology that lowers prices in real time by looking for ways to cut costs. For Jet.com, which has been pouring money into splashy TV ads and other marketing, it will provide big financial backing. The move follows a series of acquisitions by major traditional retailers of online startups in an extremely competitive landscape. In January, Hudson's Bay, which owns Saks Fifth Avenue, purchased flash-sales site Gilt Group. And in June, Bed, Bath & Beyond scooped up One Kings Lane. "We're looking for ways to lower prices, broaden our assortment and offer the simplest, easiest shopping experience because that's what our customers want," said Doug McMillon, president and CEO, in a statement. Marc Lore, co-founder and CEO of Jet.com noted in a statement that the combination of Wal-Mart's retail expertise, purchasing scale, sourcing capabilities, distribution footprint and digital assets together with the team, technology and business we have built at Jet— will allow the company to deliver more value to customers. Jet.com, launched in July 2015 under Lore, set out to reinvent the shopping cart. It now sells 12 million products, from jeans to diapers, coming from more than 2,400 retailers. The company, which touts its service, delivers to two-thirds of the country overnight in its purple boxes. In some high-density regions such as New York City, Jet often can offer same-day delivery at no additional cost. It was unclear as of Monday morning what the arrangements were for Lore. Wal-Mart, meanwhile, reported in May that global e-commerce sales rose 7 percent in the first quarter, weaker than the 8 percent in the previous quarter and far below the 20 percent increases seen less than two years ago. So it trimmed its free-shipping pilot program ShippingPass to two-day delivery from three and cut a dollar off the membership to $49 a year in an attempt to answer Amazon's Prime program. But while Amazon's Prime membership costs $99 a year, it comes with a lot of perks like streaming music and video and household subscriptions. Jet has faced plenty of challenges, though. Three months, after Jet.com launched, it ditched its annual membership fee of $49.99, leading critics to question the business model. So Jet.com promised to undercut Amazon and other retailers by 4 percent to 5 percent instead of larger discounts. But Jet.com is not a discount site. It is built on a real-time pricing algorithm that determines which sellers are the most efficient in value and shipping and adjusts prices based on what items are in the checkout cart, as well as how far the desired products are from the shopper's home. So as shoppers put items in their cart, they're encouraged to add more to build a more efficient cart and buy items labeled "smart cart" for more savings. Users can even further customize orders for more savings. For instance, if they waive the right to return an item — a huge cost for online retailers — prices drop even more. In May, Lore told The AP that Jet.com had expected to reach overall profitability in 2020 and to hit $20 billion in general merchandise value with 15 million customers. Lore said the company wanted to make sure people know about it and was taking its profit from selling products and investing it in advertising. Jet.com was also testing the sale of fresh food like eggs.